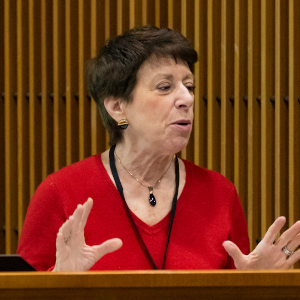 The third annual NIEHS Global Environmental Health (GEH) Day June 6 highlighted research and projects from around the world that translate research into action. Christine McEntee, executive director of the American Geophysical Union (AGU), delivered the keynote address. Panel discussions featured global environmental health fieldwork and efforts to convert research findings into improvements in public health. Organizers rounded out the agenda with a poster session describing new research findings, a roundtable discussion, and networking time. “GEH Day is about bringing colleagues together and about putting the ‘E’ in global health,” said Trisha Castranio, from the NIEHS GEH program. The event attracted about 100 attendees in person and another 60 from across the world via webcast. “Our two main purposes are to raise awareness here of the global health burden of environmental exposures and to bring people together from the environmental and global health communities, in RTP [Research Triangle Park] and around the world,” said John Balbus, M.D., NIEHS senior advisor for public health. 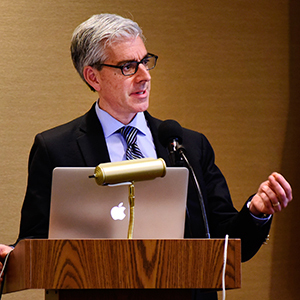 NIEHS Deputy Director Rick Woychik, Ph.D., underscored the institute’s commitment to global engagement. “Environmental health issues do not respect national boundaries,” he said. Keynote speaker McEntee described her organization’s growing footprint in environmental health and its cooperation with NIEHS. 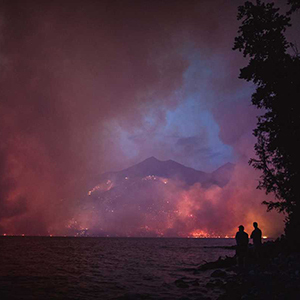 The new AGU special section on GeoHealth is headed up by NIEHS Senior Medical Advisor Aubrey Miller, M.D. That initiative is complemented by the journal GeoHealth, for which Balbus serves on the editorial board. NIEHS postdoctoral fellow Srishti Shrestha, Ph.D., moderated a panel of researchers who described GEH fieldwork experiences. Josiah Kephart and Kendra Williams, both Ph.D. candidates from Johns Hopkins University, collaborated on an NIEHS-funded study in Peru that explored the adoption of liquid petroleum gas (LPG) stoves to replace traditional biomass cookers. “We were focused not just on the research, but how this change can be applied in the real world,” Williams said. See Cookstoves and Indoor Air for more on NIEHS initiatives in this area. The work of NIEHS postdoctoral fellow Stephani Kim, Ph.D., took her to Ghana and the Chinese city of Guiyu — once known as the world capital of e-waste. 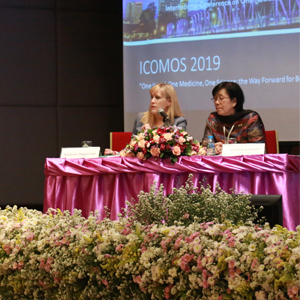 Describing her study of links between levels of metals in both pregnant women and newborns and adverse birth outcomes in Guiyu, she said that communication is key. By listening and keeping her eyes open, Kim found that information and support was always available. “We are all working for the common goal of improving public health,” said Kim about the group of panelists. A second panel, moderated by Castranio, focused on converting research findings into public health impacts. Rebecca Fry, Ph.D., from the University of North Carolina at Chapel Hill (UNC), studied prenatal exposure to arsenic in Thailand, Mexico, and elsewhere. In Mexico, she said, more than 50 percent of the women in the community were exposed to high levels of arsenic in the water. But it is even worse closer to home. “The levels of arsenic in parts of North Carolina are far greater than what we found in Mexico,” Fry added. Jim Zhang, Ph.D., from Duke University, discussed the effects of air pollution in China on cardiopulmonary function. His NIEHS-funded study in Beijing during the 2008 Olympics found links between air pollution and low birth weight. Participants appreciated the ample time allowed for roundtable talks inspired by the presentations. “We had robust discussions led by scientists on the NAEHS council,” Castranio observed. The National Advisory Environmental Health Sciences (NAEHS) Council met in the days before GEH Day (see sidebar). The poster session provided an opportunity for more scientific discovery and one-on-one discussions. This year’s Global Environmental Health Day also marked the release date of a summary report on the first four years of the NIEHS-World Health Organization (WHO) Collaborating Center. The report covers the activities of the center from 2013-2017. The NIEHS-WHO Collaborating Centre for Environmental Health Sciences was designated on Sept. 14, 2013, earning redesignation in 2017.
WHO collaborates with 800 research institutions in 80 countries, working in areas such as nursing, occupational health, communicable diseases, nutrition, mental health, chronic diseases, and health technologies. Listen as Kalpana Balakrishnan, Ph.D., from Sri Ramachandra University in Chennai, India, discusses health, safety, environmental, and economic implications of solid fuels, as well as efforts to improve cookstoves to increase fuel efficiency and reduce emissions, in this NIEHS GEH Chat. 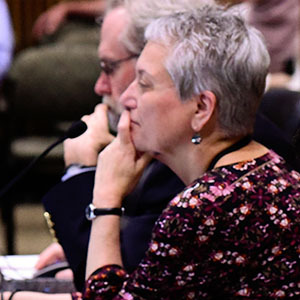 GEH Day 2018 came on the heels of a two-day meeting of the NIEHS National Advisory Environmental Health Sciences Council. Four members stayed to participate. Irasema Coronado, Ph.D., from the University of Texas at El Paso. Shuk-mei Ho, Ph.D., from the University of Cincinnati. Edith Parker, Dr.P.H., from the University of Iowa.